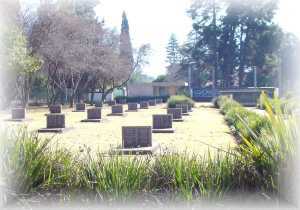 This cemetery dates from the Anglo-South African War at the beginning of the 1900's, when British forces destroyed the farms of the Boer soldiers and many women and children were left homeless. A concentration camp was established in Irene and from 1901 refugees were housed here in tents under extremely poor conditions. By the end of 1901, more than 800 of the refugees in the camp had already died. The camp was extended and eventually housed 4500 men, women and children. It was closed in 1903, a year after the declaration of peace. This site is the burial place of the people who died in the Irene concentration camp. More than 2000 people were allegedly buried at the camp, although the cemetery's name list only mentions 1 149 names. Although a name plate with a number of 2,156 was discovered, only 850 heaps of soil, indicating graves, could be found. The original gravestones, generally hand-engraved on slate as at the Cottesloe monument, were removed and placed under cover to prevent further weather damage. The grave sites were formalised with stone plaques on which the names of the 1 149 persons buried in the cemetery were engraved. In 1901 alone 808 people died, and 973 of the total were children. The cemetery is a national monument. The 80 memorial stones in the cemetery contain all the names on the list of names.